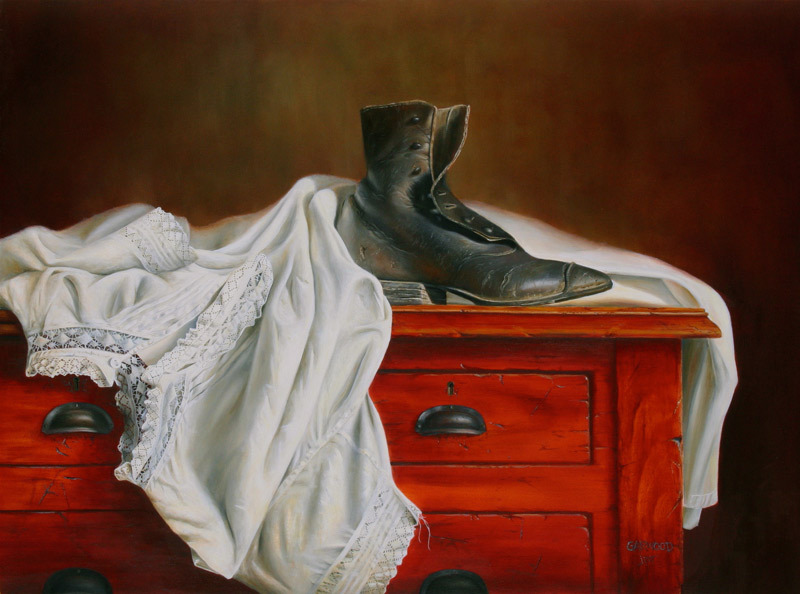 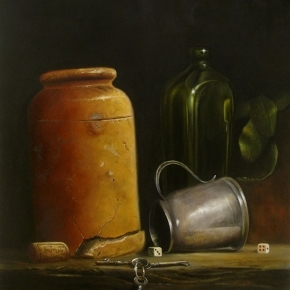 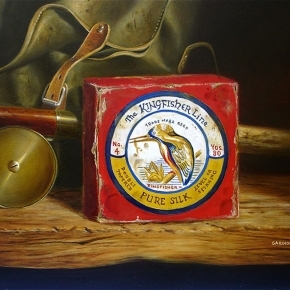 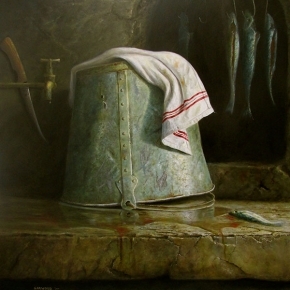 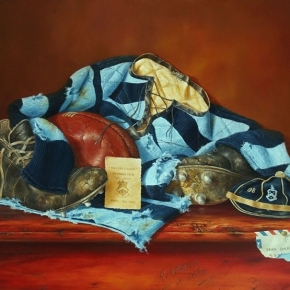 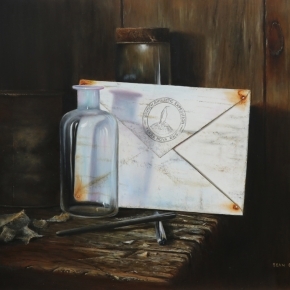 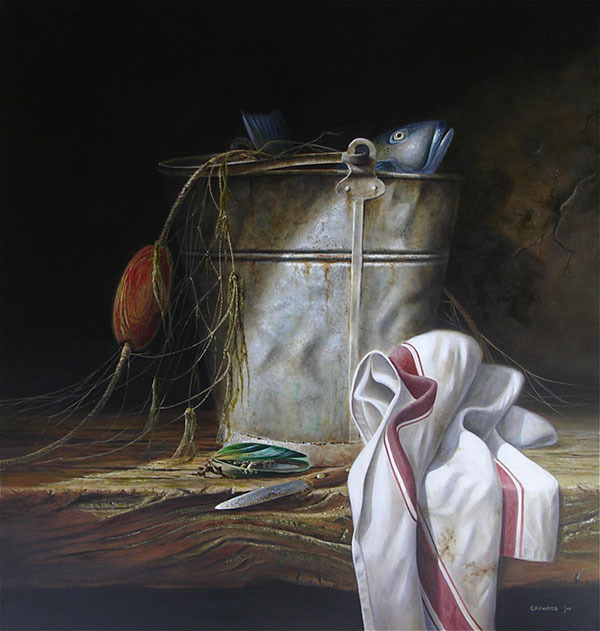 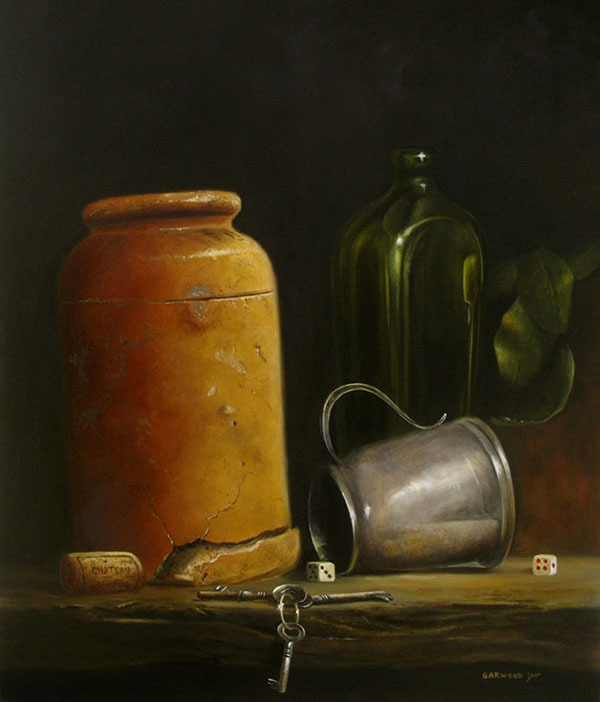 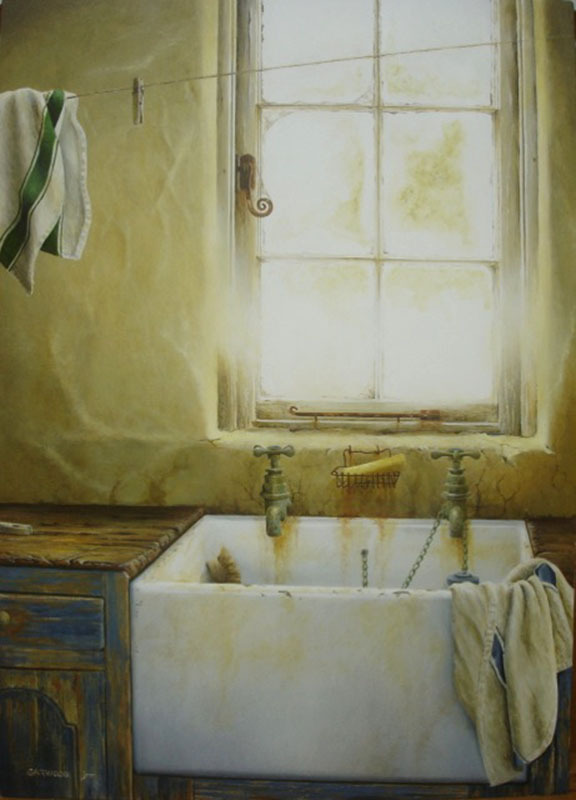 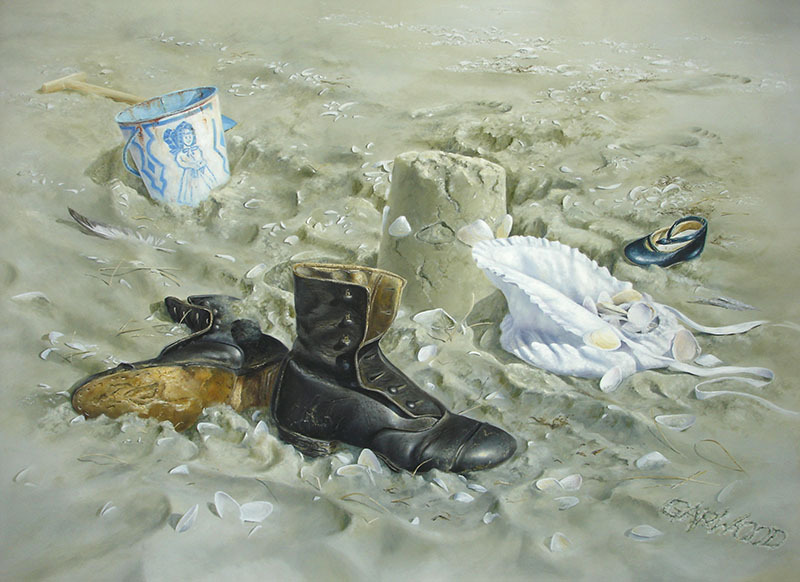 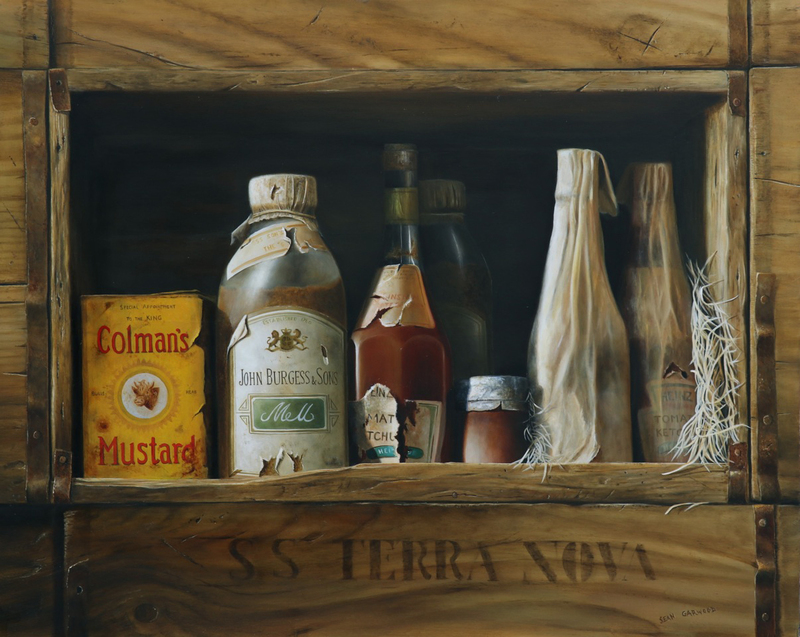 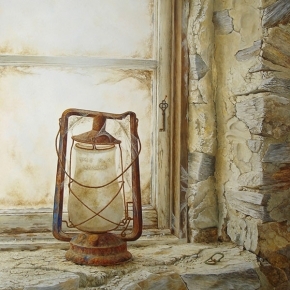 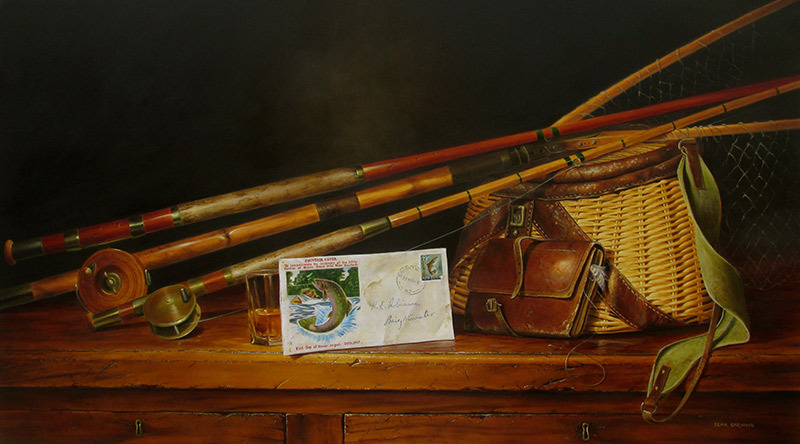 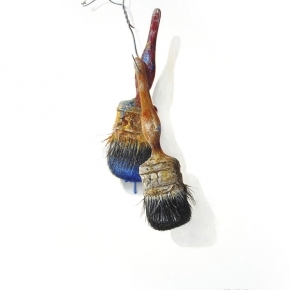 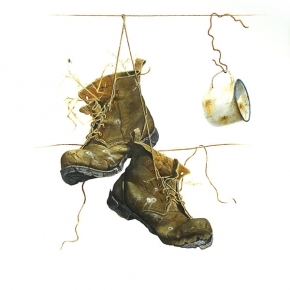 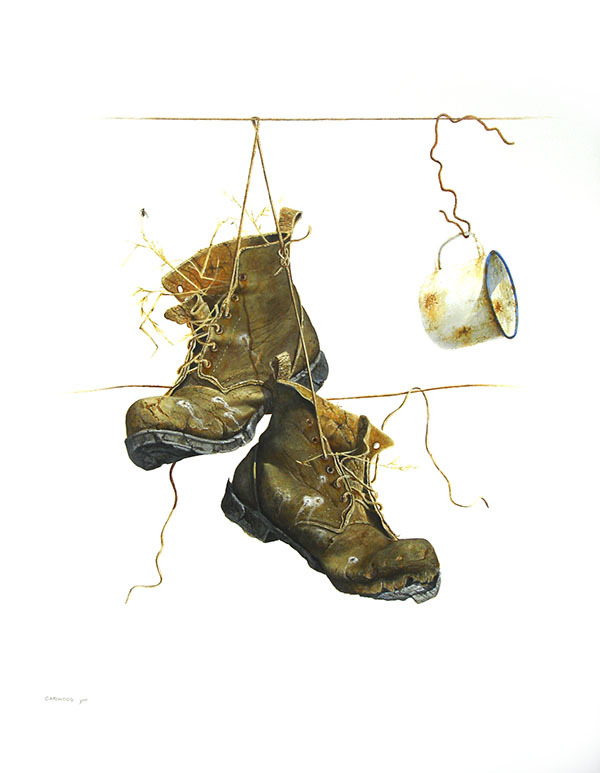 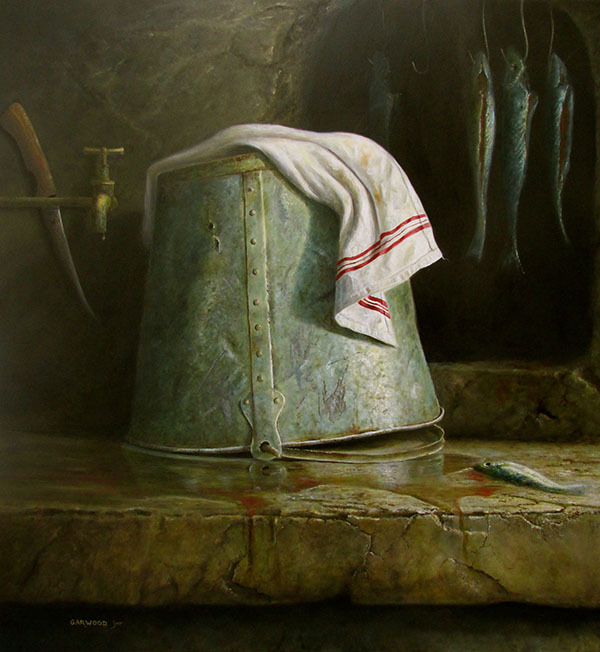 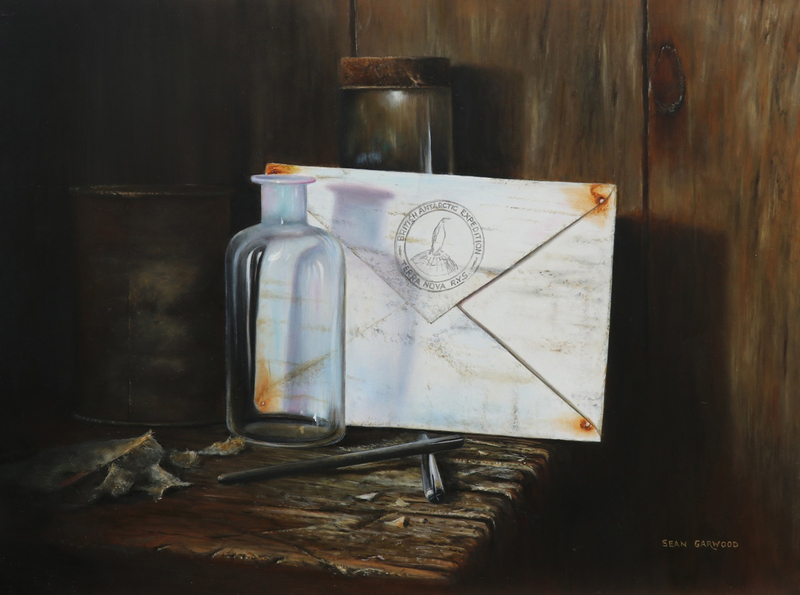 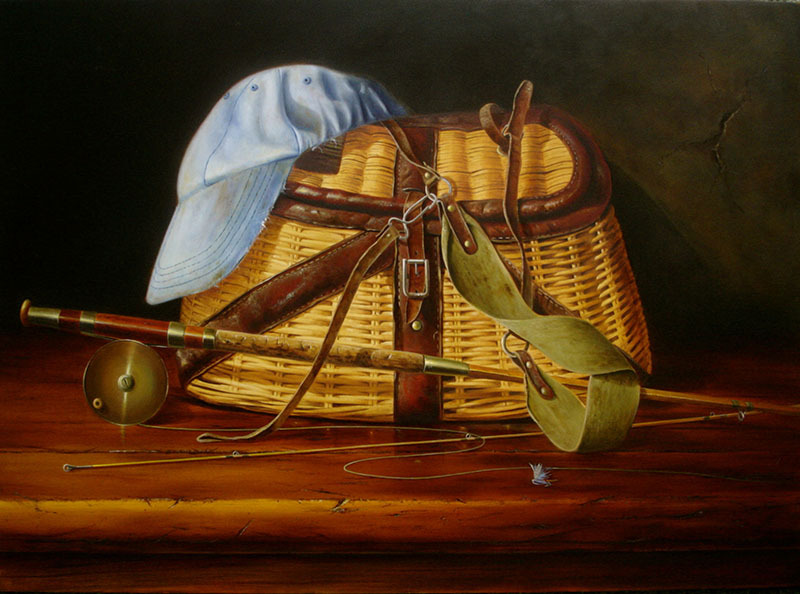 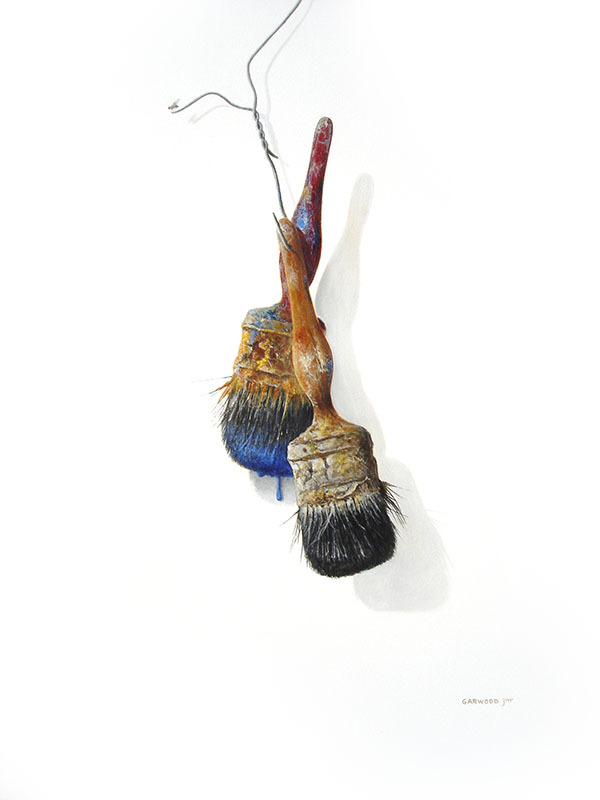 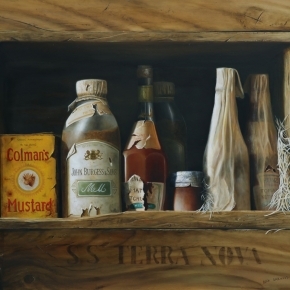 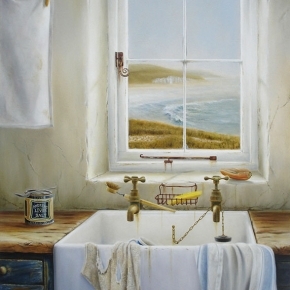 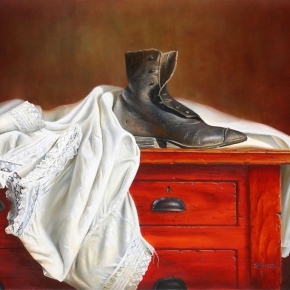 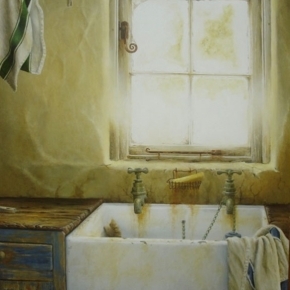 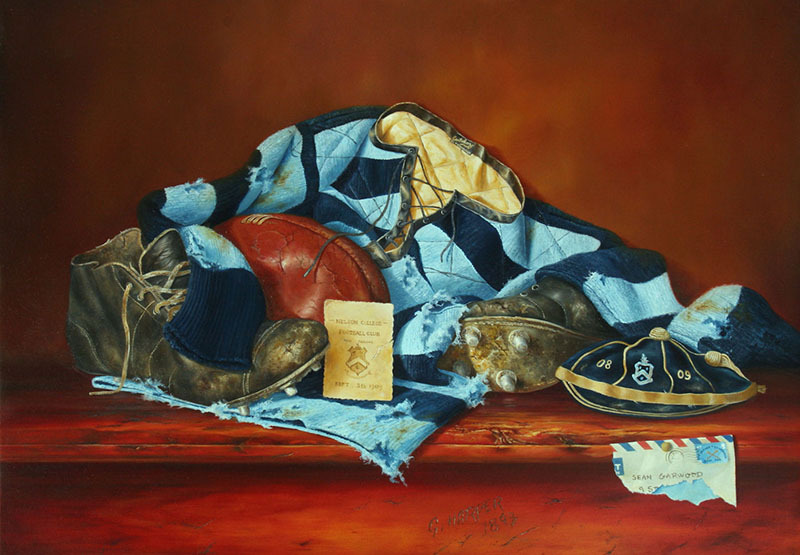 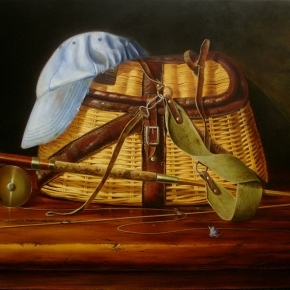 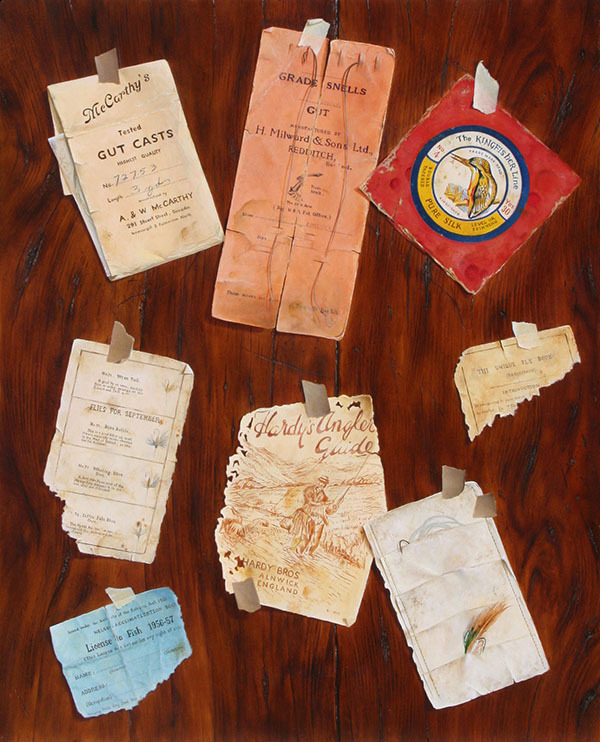 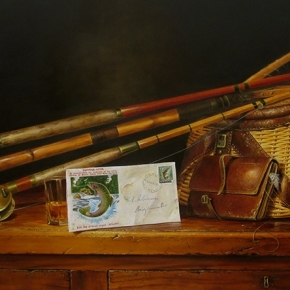 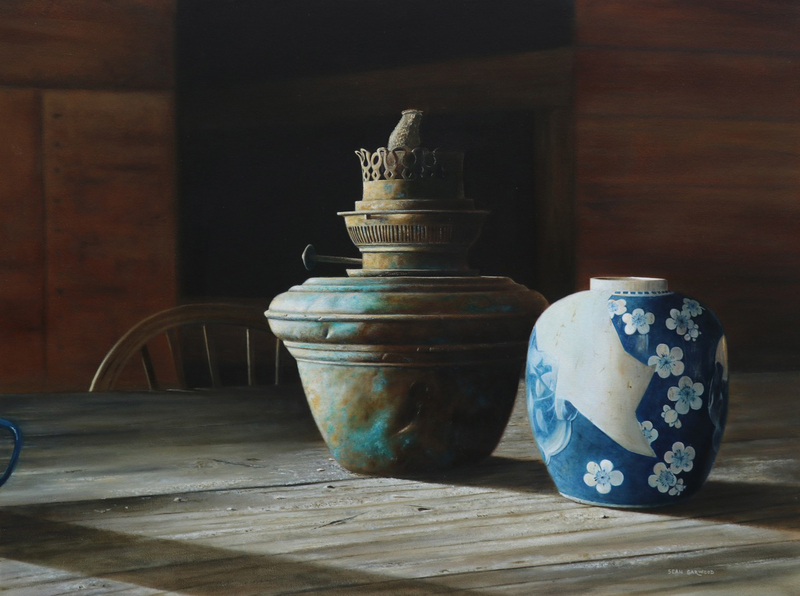 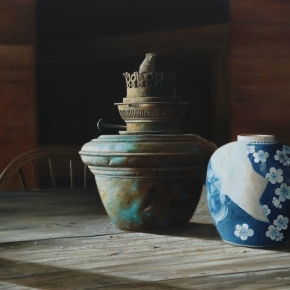 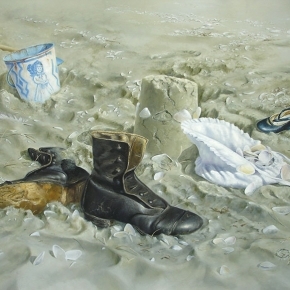 Sean Garwood is a masterly painter of classic realism in finely detailed still-life paintings. 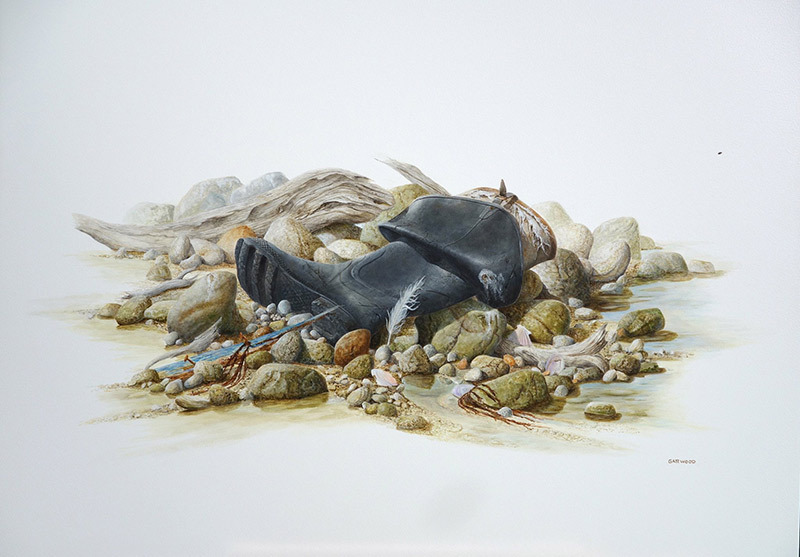 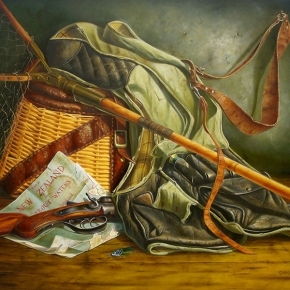 Living in Nelson, New Zealand, he draws his inspiration from colonial subjects and country sport, mainly of New Zealand’s South Island. 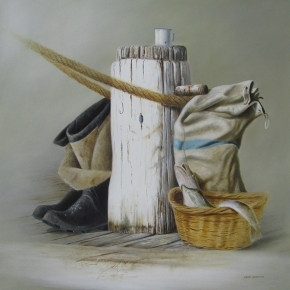 Sean follows the traditional classic techniques which allow him to create timeless images rendered in exquisite detail that evoke a feeling of romantic nostalgia. 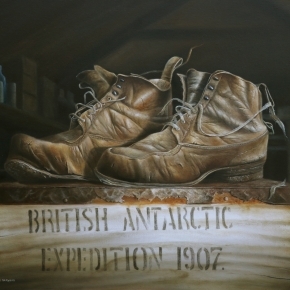 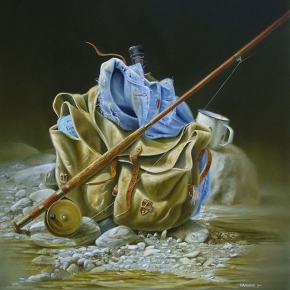 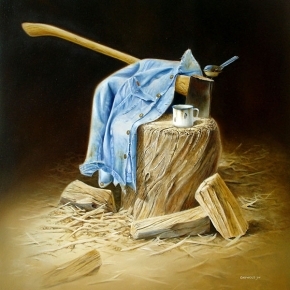 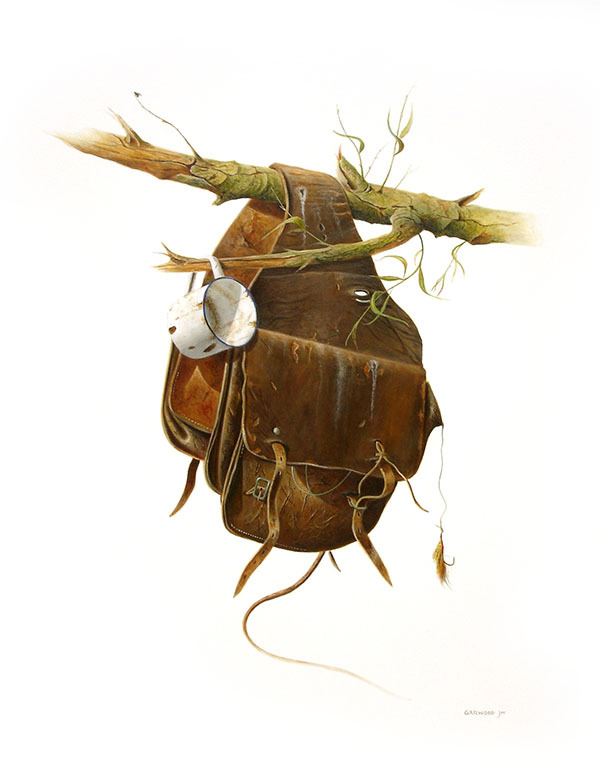 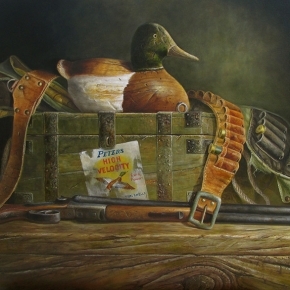 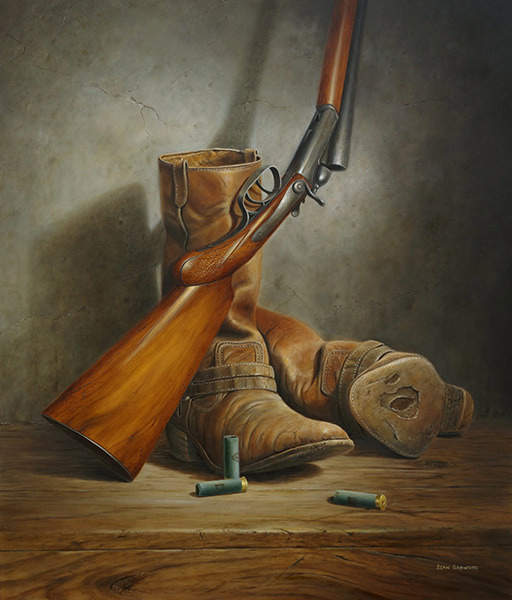 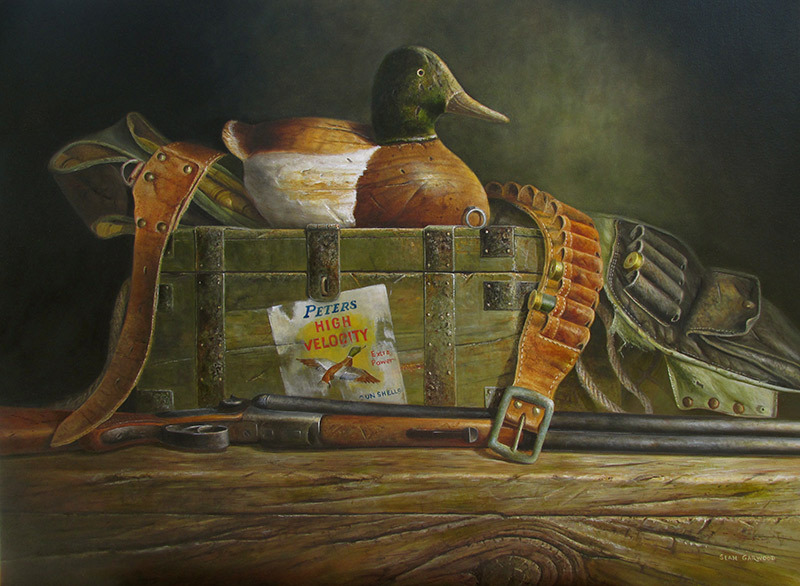 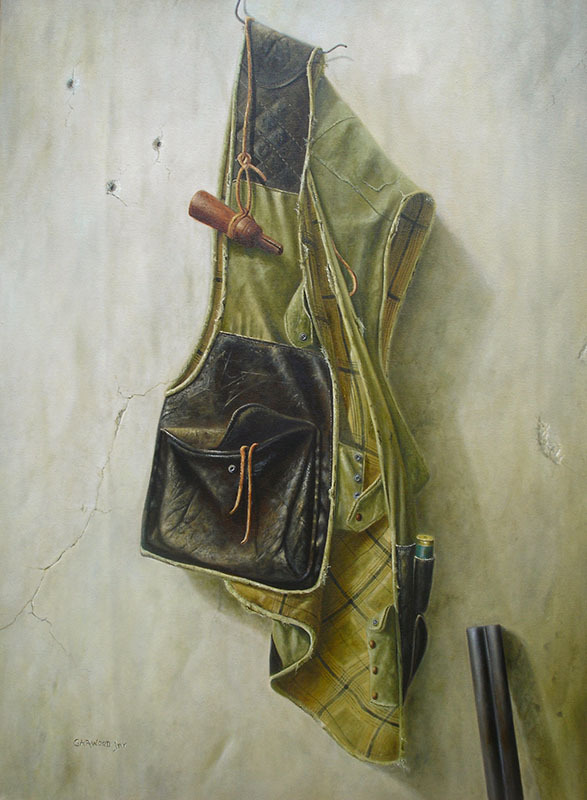 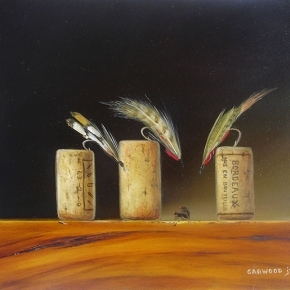 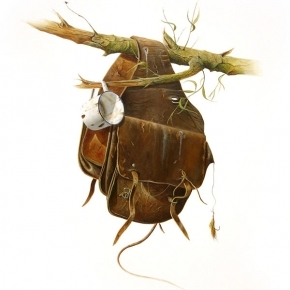 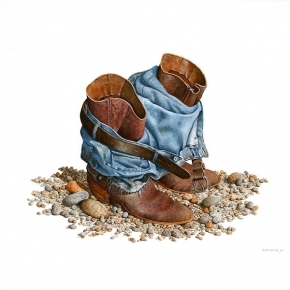 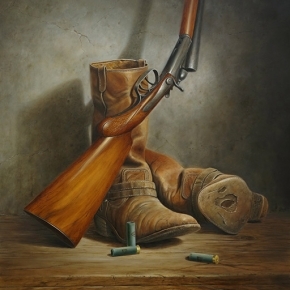 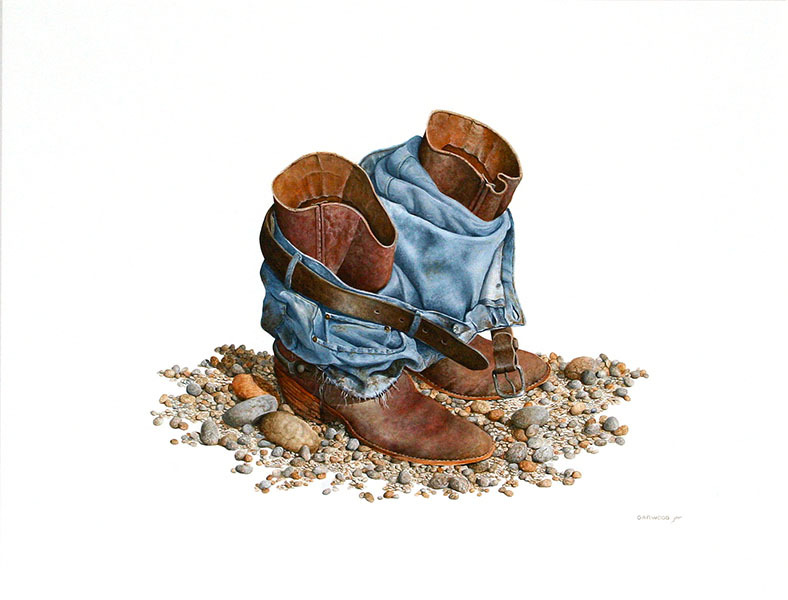 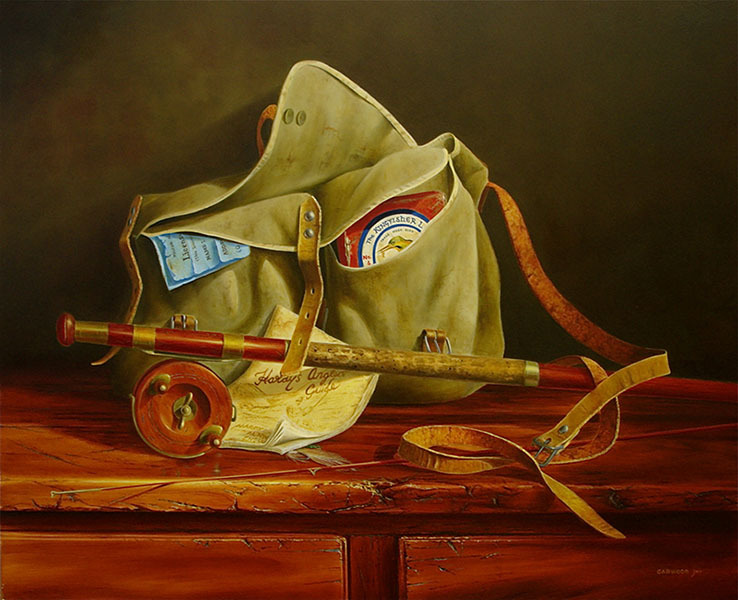 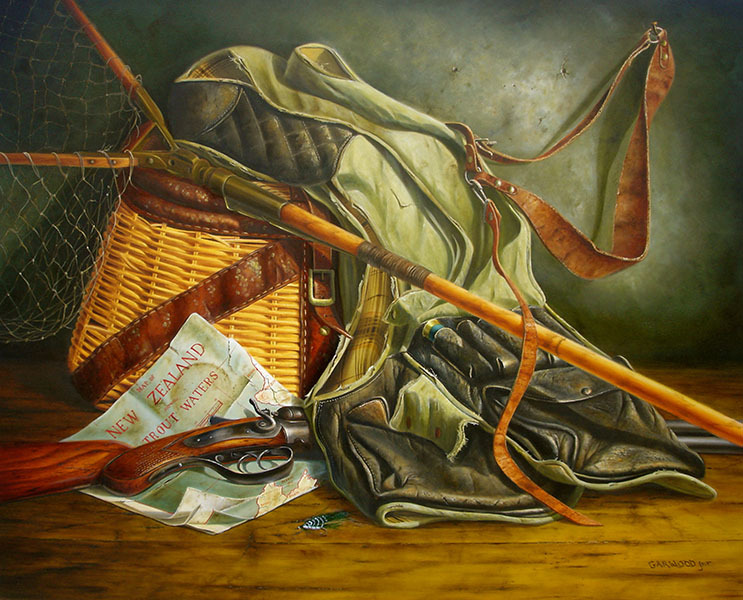 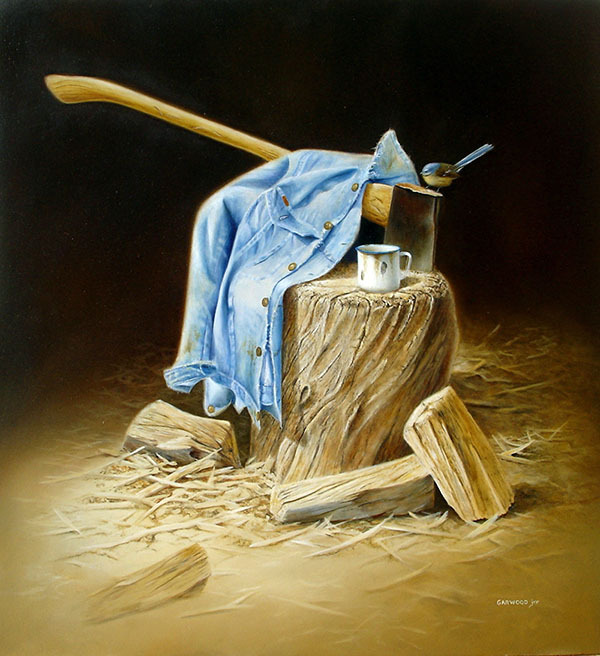 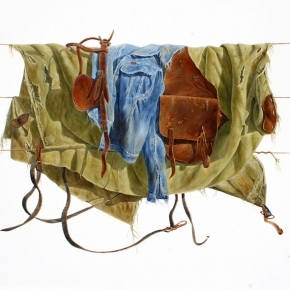 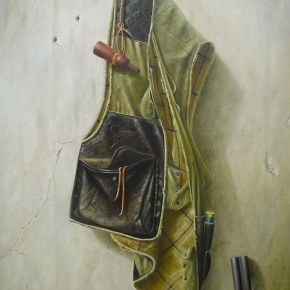 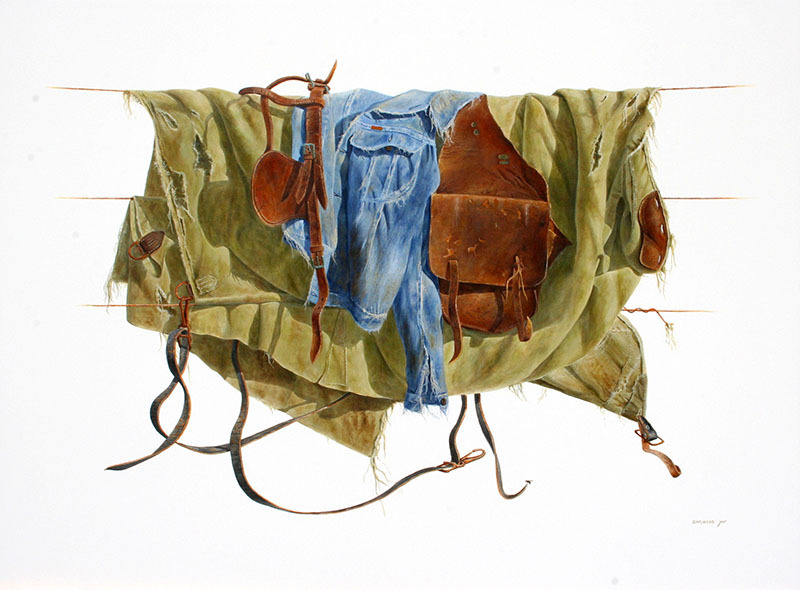 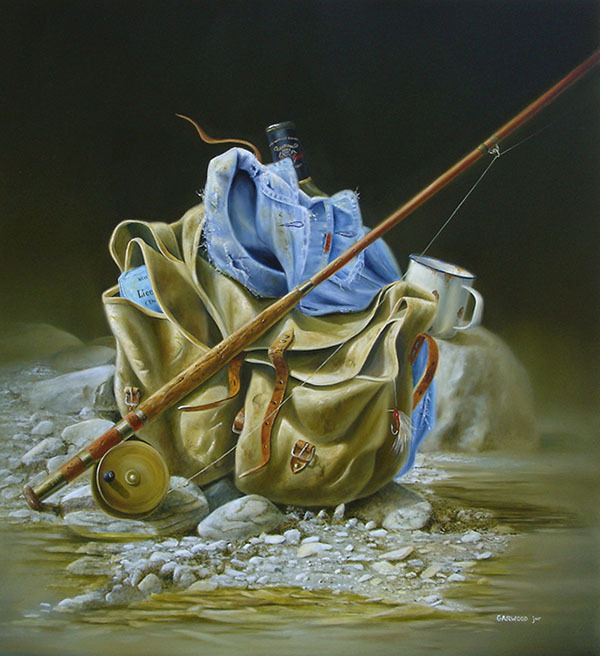 Sean Garwood’s almost obsessive attention to detail creates works that are rich in light and texture – the folds of fabric, the toughness of dry leather, the glint of light on a belt buckle- and it’s in these details where one begins to truly appreciate Garwood’s technical and compositional skills. 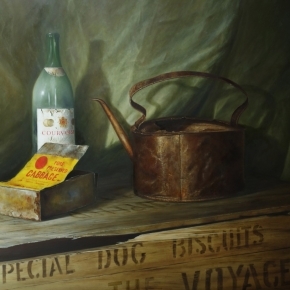 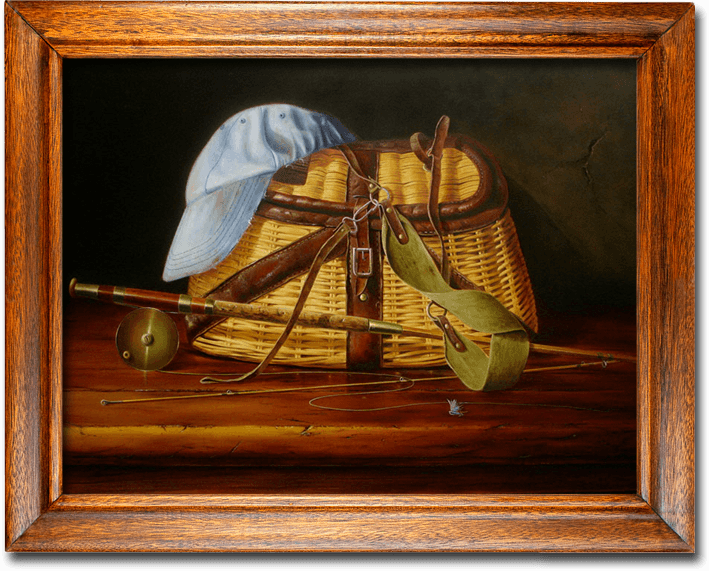 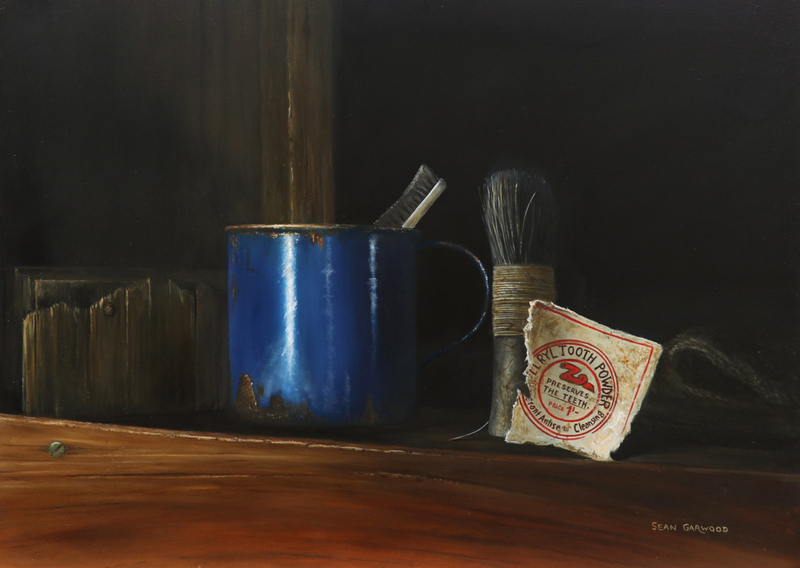 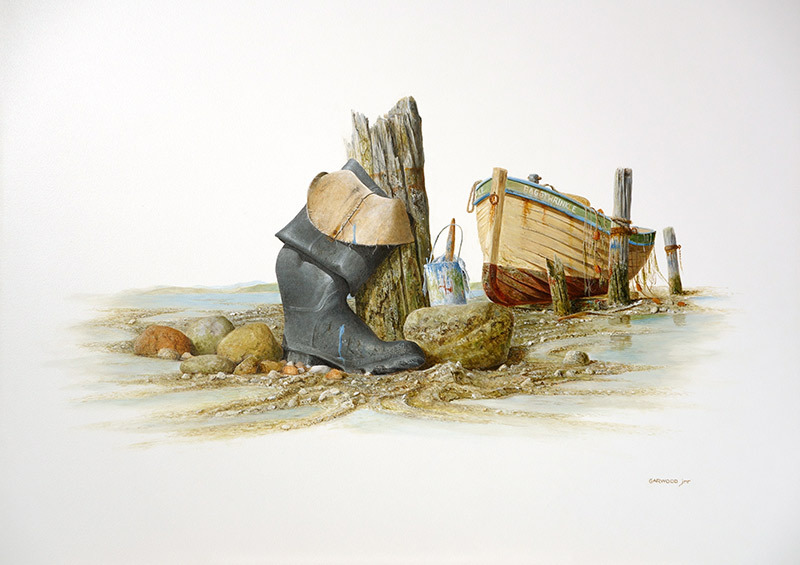 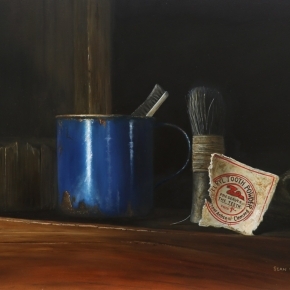 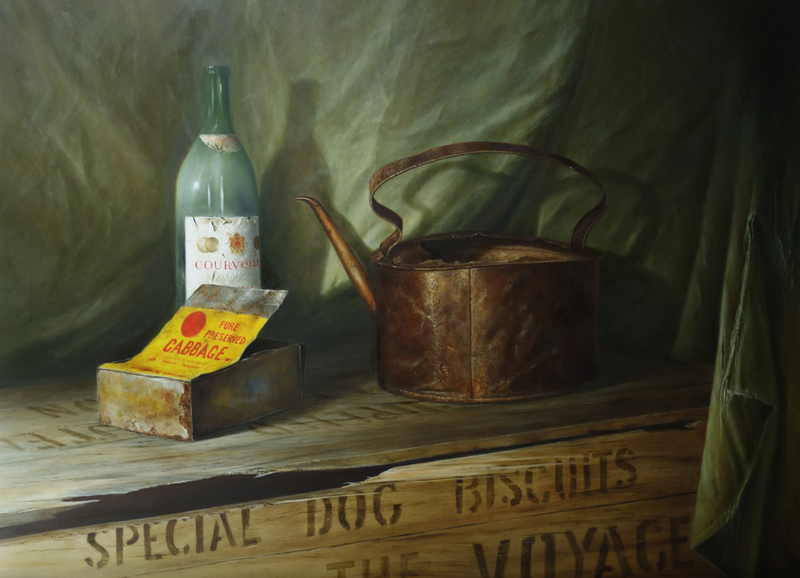 It is in Garwood’s work where one is most likely to be surprised by how such a simple arrangement of everyday objects can be rendered so thoughtfully so that the not-real is so very nearly -real and this is the true skill of the realist painter. 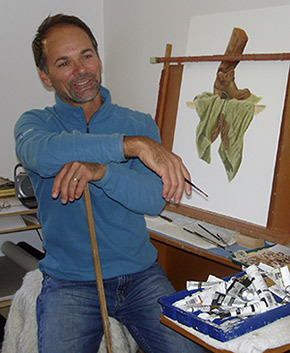 Garwood has also studied in depth the techniques used by the old masters, which is essential for creating fine oil paintings. 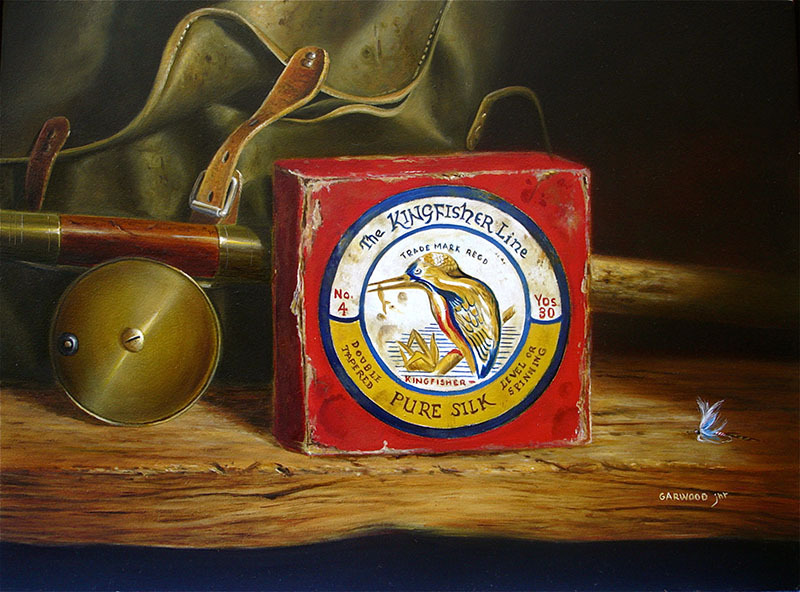 These traditional methods of oil painting will surely endure the test of time and increase the longevity of the investment. 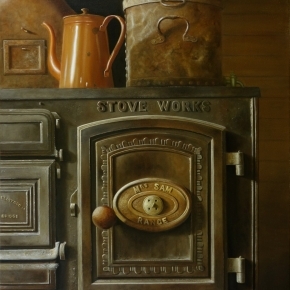 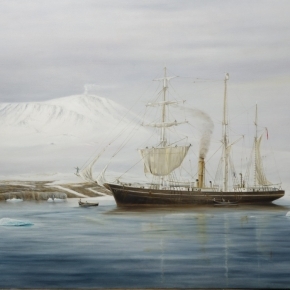 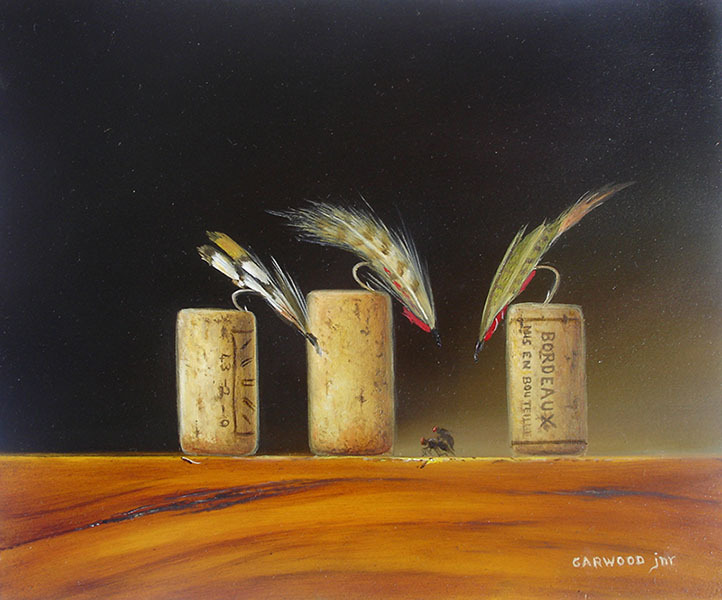 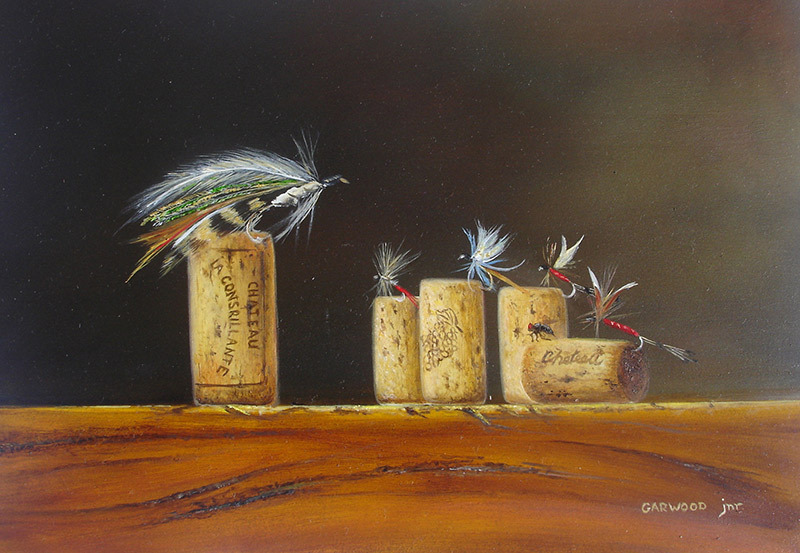 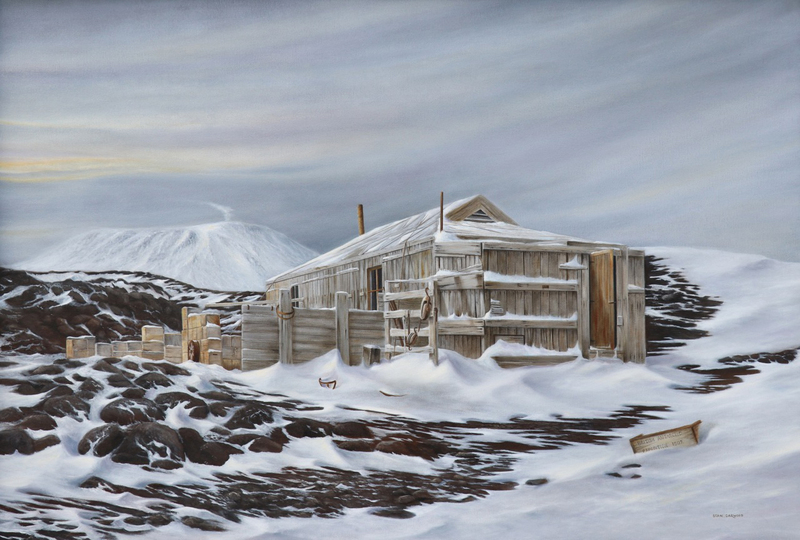 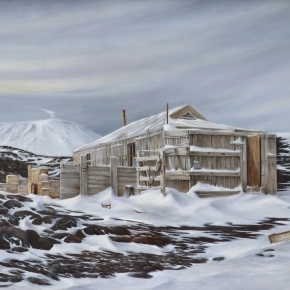 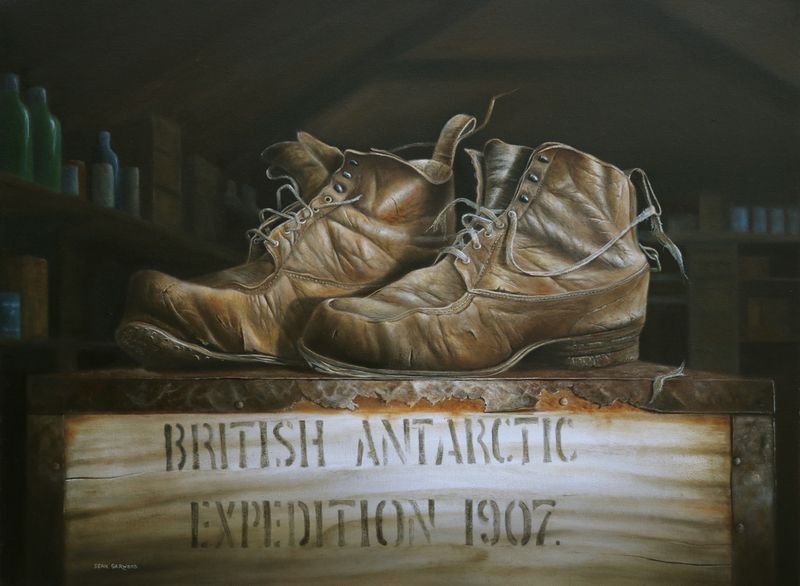 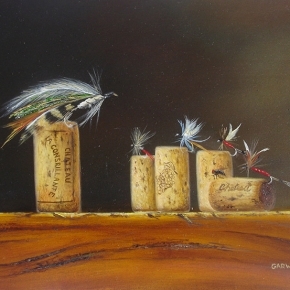 Garwood’s own unique style of classic realism stand him alongside New Zealand’s leading and well known realists artists. 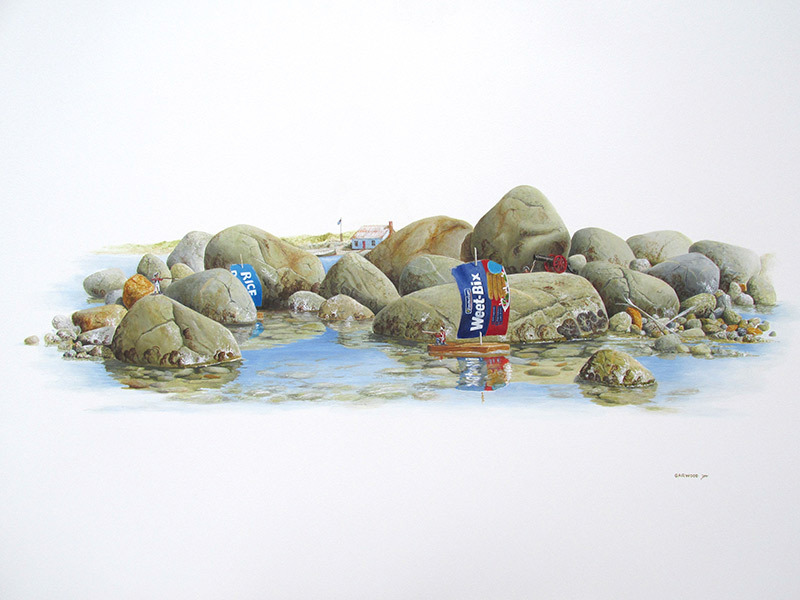 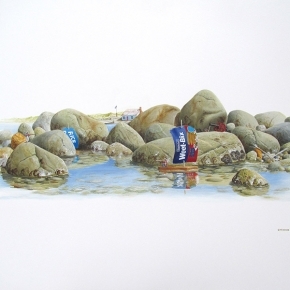 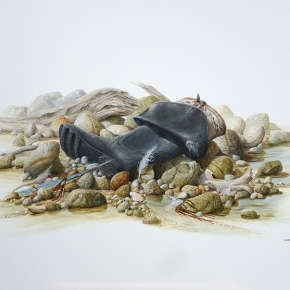 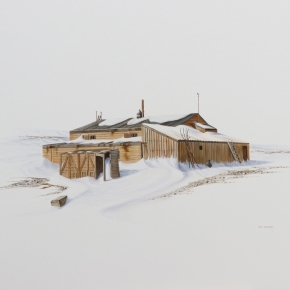 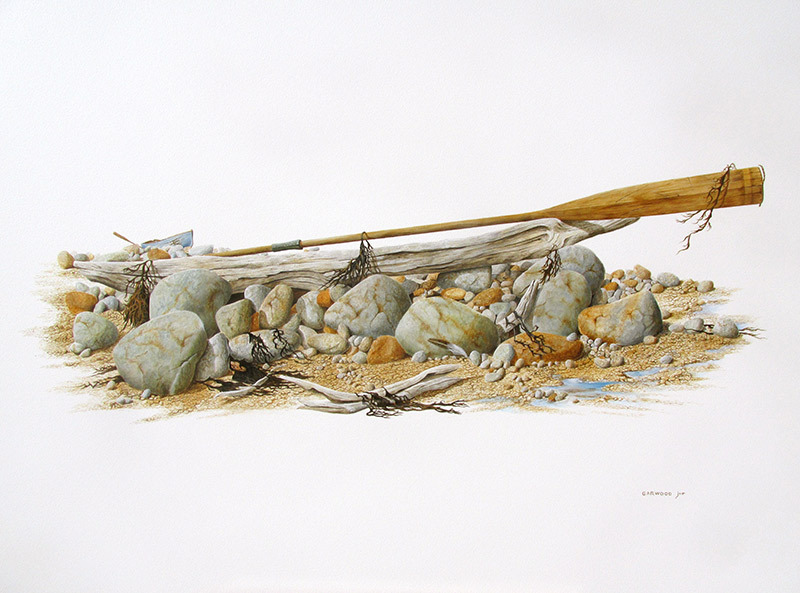 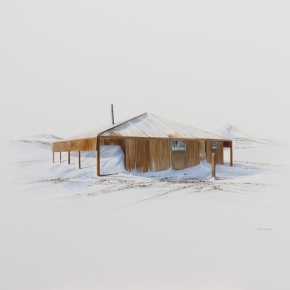 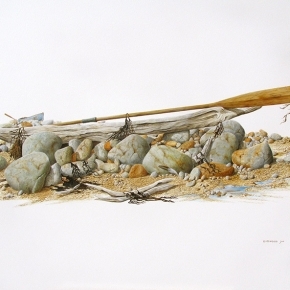 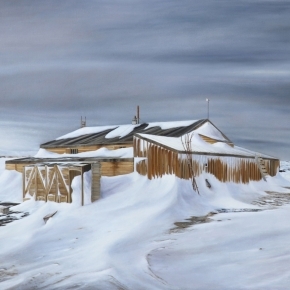 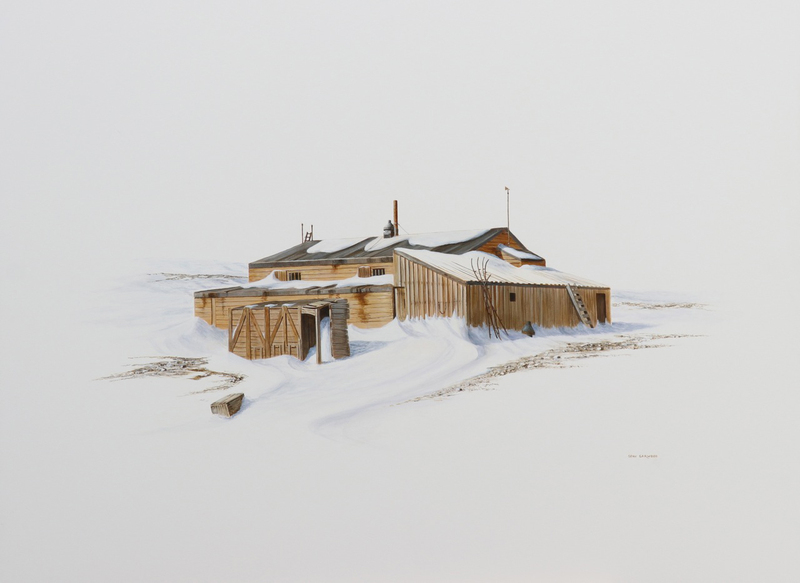 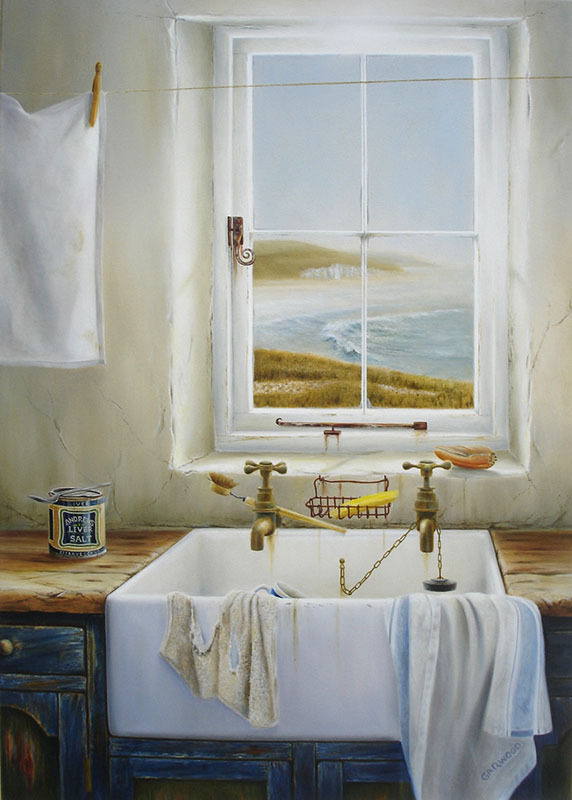 Nelson Artist Sean Garwood was born in England and grew up in Western Australia. 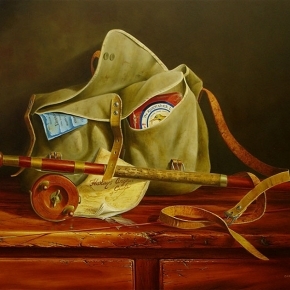 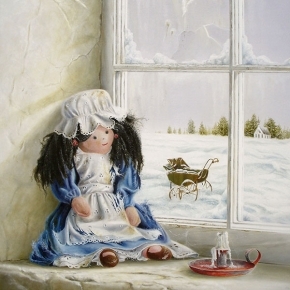 From a very young age Sean was influenced by his father’s highly successful full-time painting career. Growing up on the coast near the Port town of Fremantle Western Australia and motivated by his fathers success, Sean would spend many hours sketching amongst Fremantle’s rich maritime heritage. 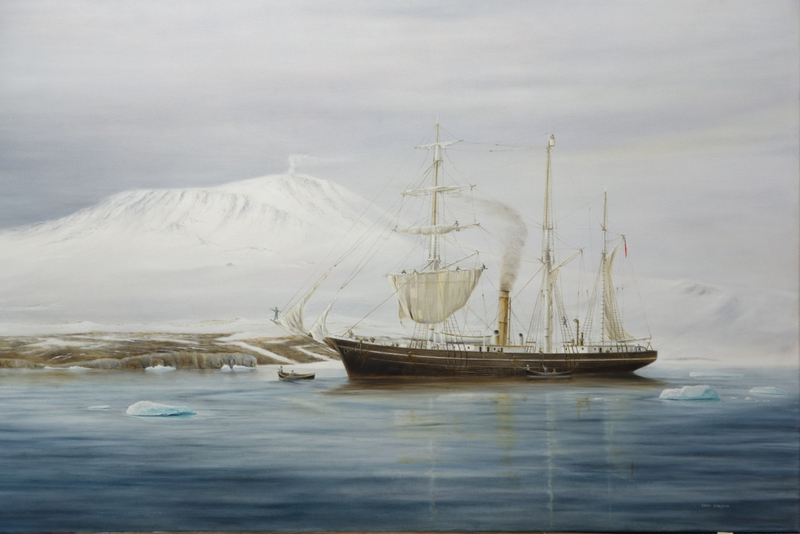 During this time his father was exhibiting his work throughout Australia and later New Zealand. 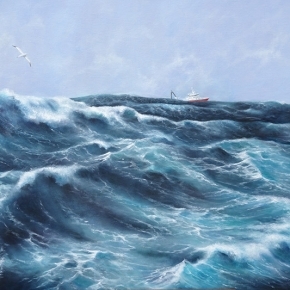 Thoughts of becoming a full-time artist like his father were put on hold as the natural progression of a boyhood dream to become a Ship’s Master became a reality. 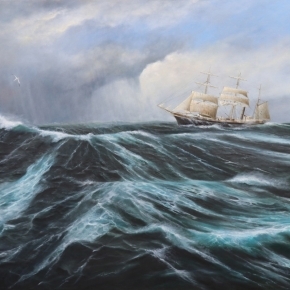 After arriving in New Zealand at the age of 15 he became the youngest New Zealand Deep Sea Master at only 21. 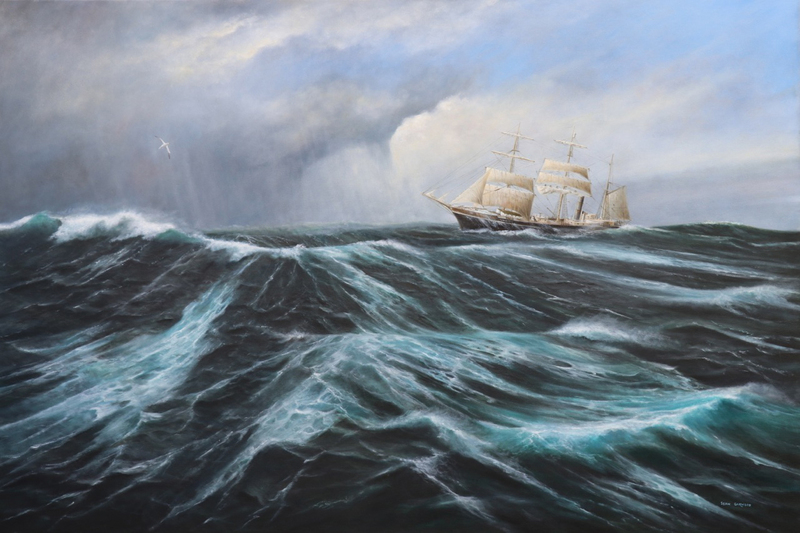 The family has a rich maritime history including being a descendant of Admiral Eliab Harvey, who was Captain of the “Temeraire” at the battle of Trafalgar. 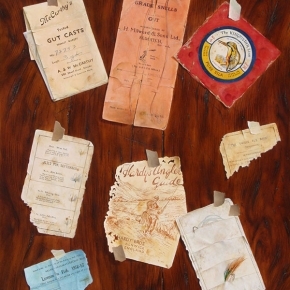 The earlier family name being Harvey-Garwood. 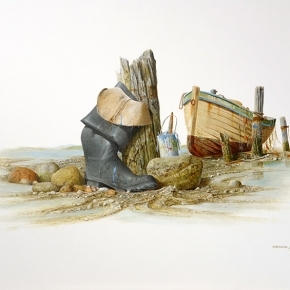 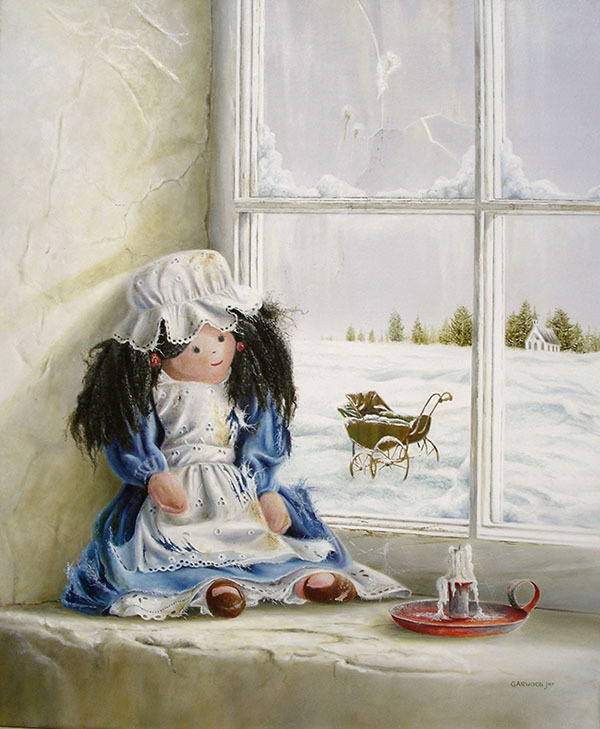 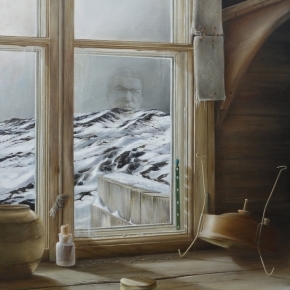 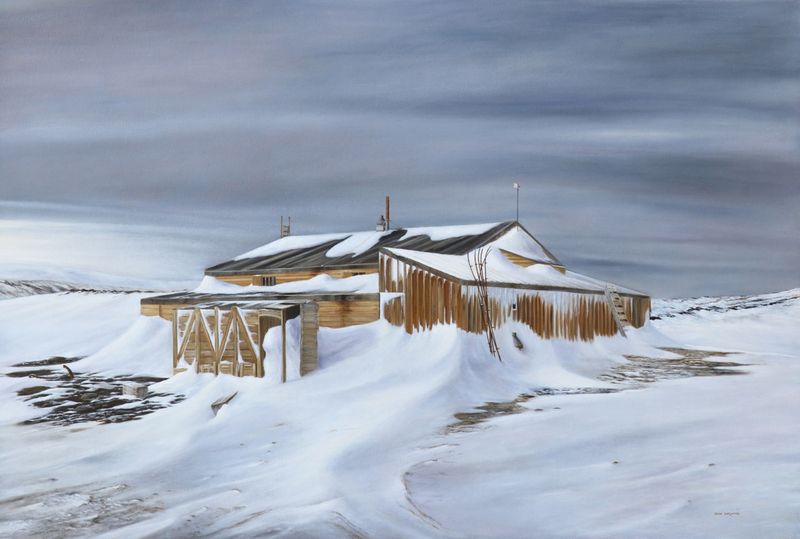 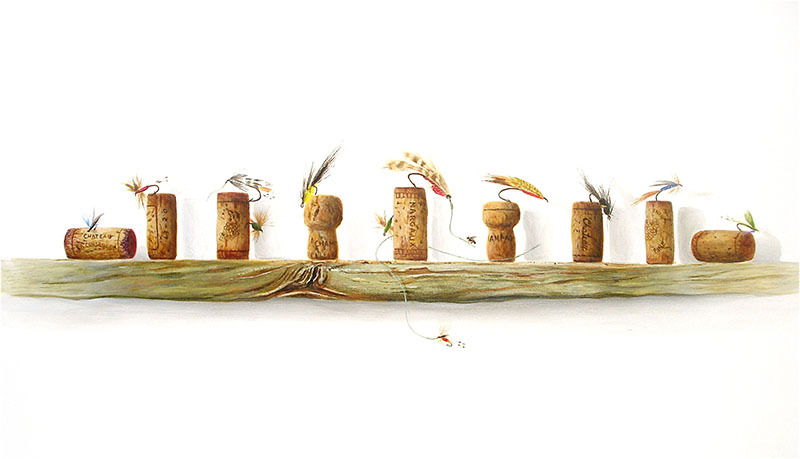 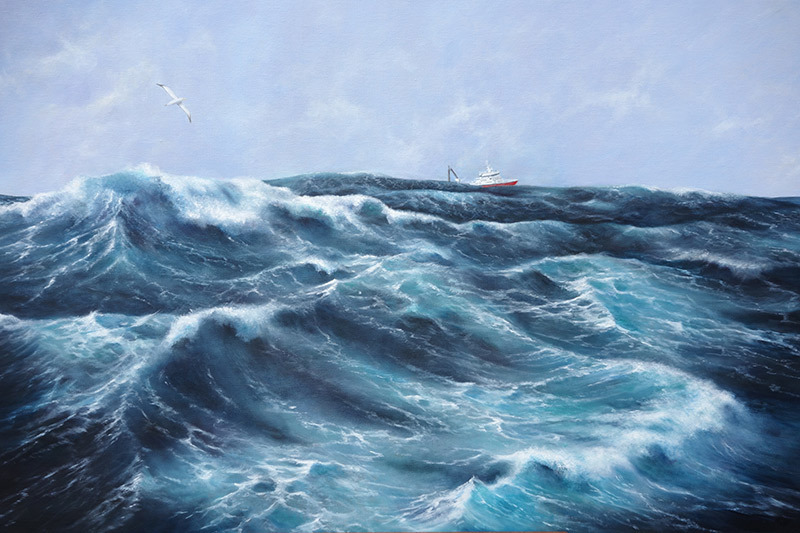 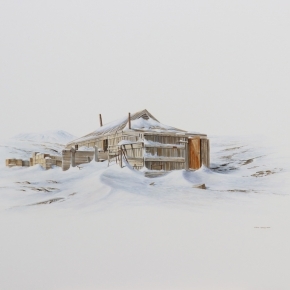 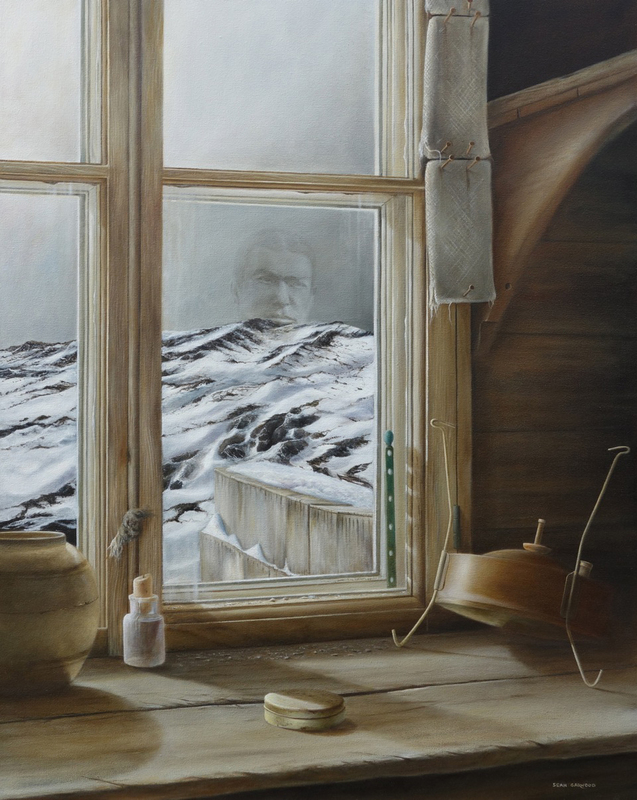 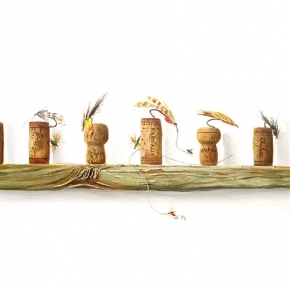 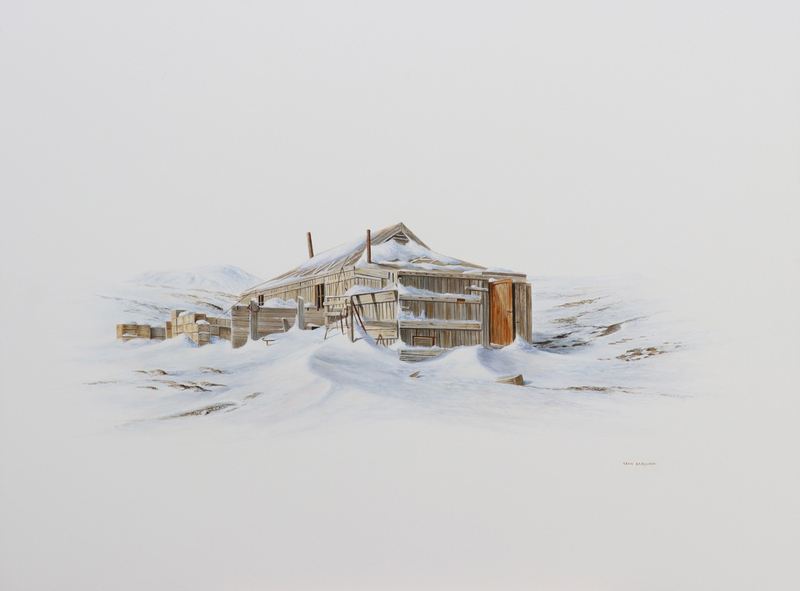 During his many years on the sea, Sean continued to draw and was increasingly influenced by his fathers meticulous detailed compositions and never lost the inspiration to take up a full-time painting career. 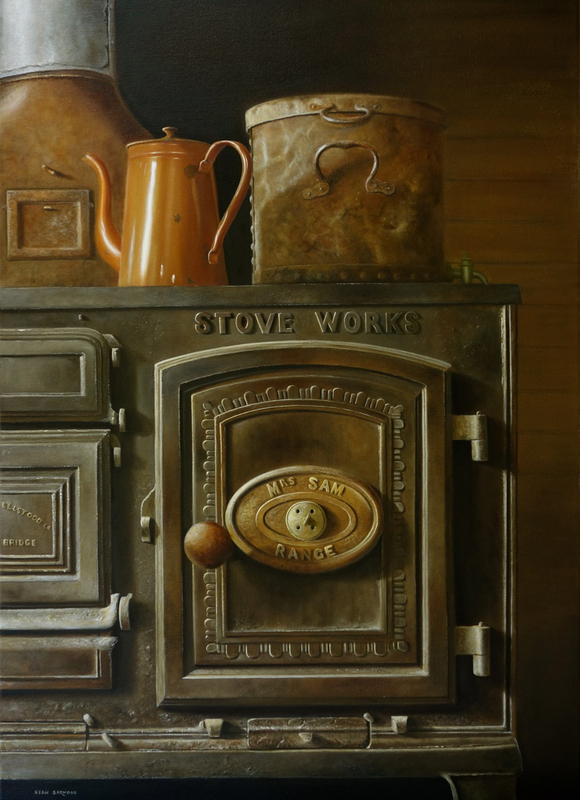 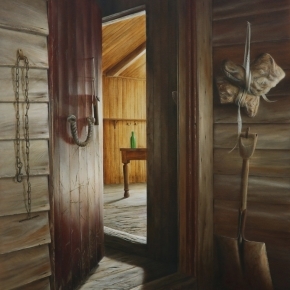 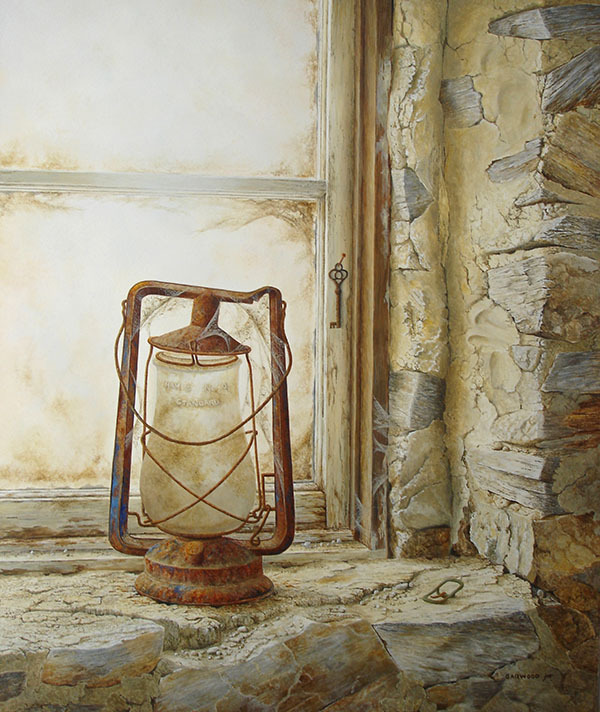 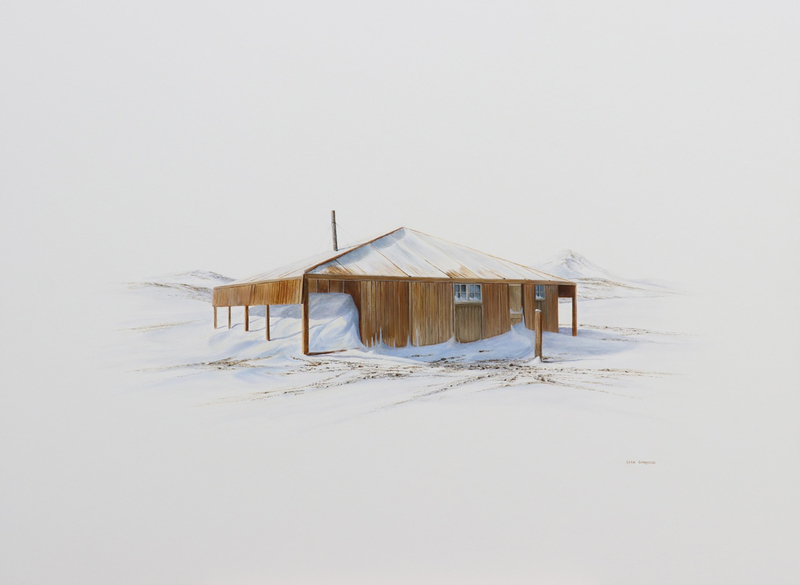 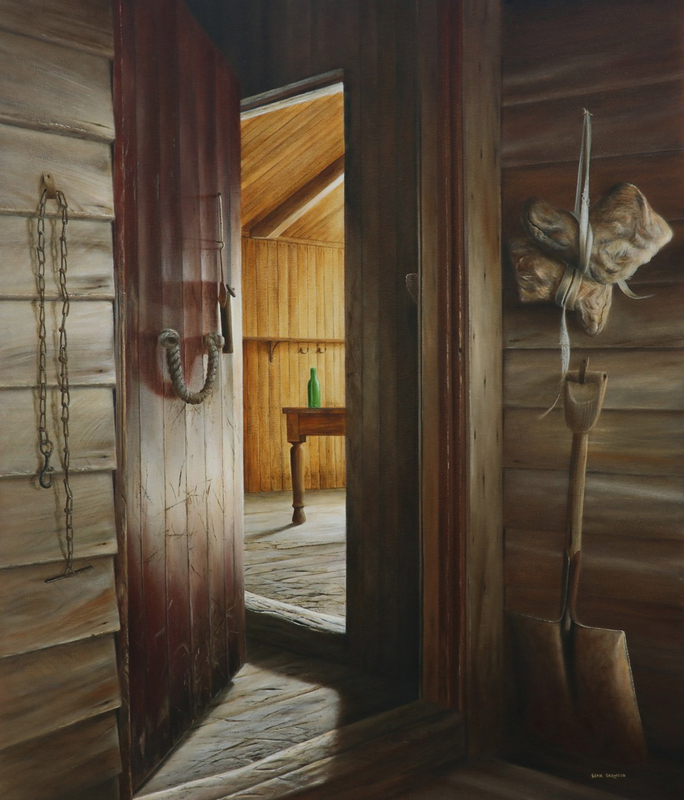 Sean, along with his wife Ligliana and two daughters, currently resides on a country property in Nelson that he terms ‘absolutely conducive’ to painting.